Good News For Texas Consumers! In a recent article on the website, “The Real Deal”, Texas was named one of the best states for transparency relating to disciplinary actions taken by the Commission. Thanks to the hard work of the Commission, Texas consumers can reliably search disciplinary history and ensure they know disciplinary histories of the people they are working for. New York State has a remarkably unwieldy system for recording disciplinary actions against real estate brokers, with low usability and confusing organization. But how much better are other states doing? The answer, it turns out, is a lot. In an analysis of equivalent public disclosure systems in six U.S. states with major real estate markets – California, New York, Florida, Texas, New Jersey and Illinois – the New York Department of State’s “Decision and Consent Orders” search engine was found to be the worst by far. In the five other states examined, publicly-accessible disciplinary action records provide consumers with a variety of useful features, such as 1) periodic reports of recent disciplinary actions, 2) disciplinary histories for individual brokers, or even 3) the ability to search for violations by various criteria. New York’s DOS provides none of the above. In New York state, the licensing of real estate brokers is administered by the DOS, whose Division of Licensing Services regulates a variety of occupations, including nail salon technicians, security guards and notaries public. 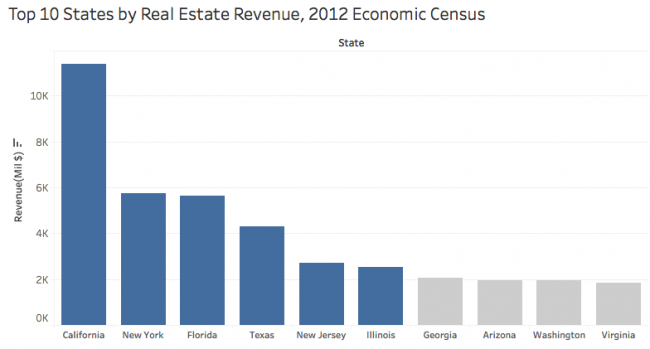 By contrast, most other states surveyed had agencies or divisions dedicated to the real estate industry alone, such as the Real Estate Commissions of Texas, Florida and New Jersey, or California’s Department of Real Estate. 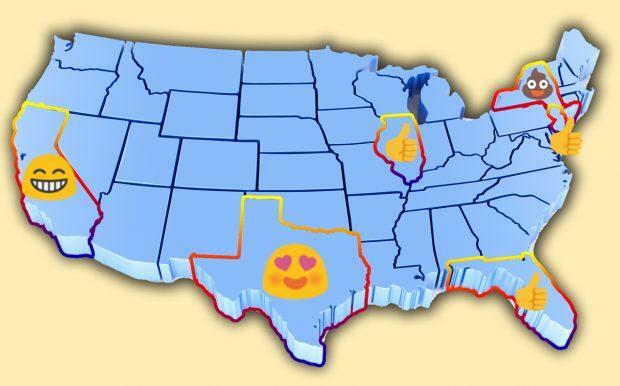 Texas was only state examined which provided a flexible search engine for consumers, allowing users to construct custom queries using various criteria. With records of about 1,000 disciplinary actions taken against brokers and sales agents from 2007 to the present (and more actions against home inspectors and instructors as well), TREC’s disciplinary action search allows users to search for violations in a specific city, date range, or violation type, as well as searching for individual brokers and cases. For many cases, the relevant documents may also be viewed directly in the search results, though others require freedom of information requests. 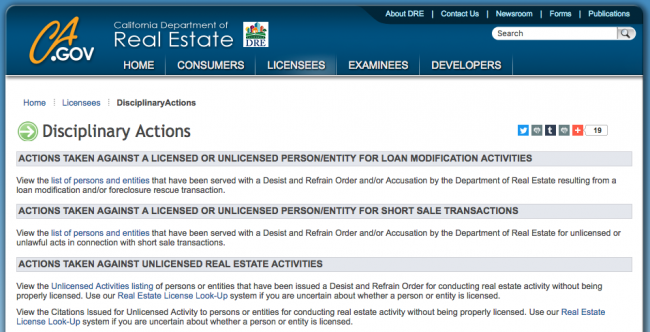 Although lacking the full flexibility offered by Texas’ interface, California’s Department of Real Estate addresses common consumer queries by providing lists of actions categorized by violation type, such as loan modification, short sale transactions, or unlicensed activity, accompanied by the relevant documents in many cases. Additionally, the department provides monthly summaries of enforcement actions for each individual month from March 2010 to the present, covering a whopping 9,781 separate actions – perhaps not too surprising for the nation’s largest real estate market. These three states provide monthly (NJ and IL) or annual (FL) reports on disciplinary actions, but little else in terms of search functionality, such as the ability to search by city or violation type. In Florida and Illinois, information about a licensee’s disciplinary history can also be found by searching for that individual licensee. Florida’s records include over 2,000 actions taken from 2005 to 2016, hence losing points for the lack of data on 2017 and 2018. Illinois’ records include over 1,600 real estate actions from 2007 to the present, losing points because they are mixed in with various other types of licensees. New Jersey’s records cover over 500 disciplinary actions against brokers from 1996 to the present. The many inadequacies of New York State’s broker violation disclosure have already been detailed in depth. While New York does provide access to original administrative documents, which is not something all other states do, in New York’s case these raw documents are the only thing available for examination, with minimal effort put into classification, summarization or organization. Even within the state, the New York Department of State’s system compares poorly to other state agencies with similar responsibilities. Like the DOS, the New York State Education Department (NYSED) is responsible for disciplinary actions against practitioners of a variety of occupations, from accountants to veterinarians, and provides a website where consumers can look up this information. NYSED’s Enforcement Actions page allows users to efficiently search through over 12,000 actions from 1994 to the present, by name or by month and profession, and view summaries of violations and actions taken. Nothing fancy, but still a level of organization that the DOS’ site doesn’t come close to matching. In previous comments, the DOS has defended its public record-keeping practices by pointing out that members of the public can file Freedom of Information Law (FOIL) requests for information on disciplinary actions. However, as of the writing of this article, FOIL requests for such information filed by TRD in late May have yet to be fulfilled, as the expected response date has been extended repeatedly. Other DOS departments appear to face similar challenges with timely public disclosure. In a recent attempt to acquire copies of limited liability company filing documents from the DOS’ Division of Corporations, TRD learned that the average turnaround time for such requests – which can only be submitted by fax, not online or by phone or email – is one week. Members of the public may pay for expedited service, but there is no way to inquire on the status of such requests except by checking if your credit card has been charged.